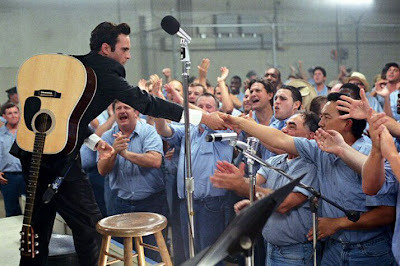 Walk the Line opens outside Folsom maximum security prison in 1968. As the camera crawls across the ground, over the prison walls and through the various corridors of the building, we become increasingly aware of a rhythmic rumbling sound. When the camera finally reaches its intended location, we discover the source of the noise. The prisoners of Folsom are all huddled around a makeshift stage which is presently populated by a couple of very nervous-looking musicians; and their clapping and the stamping of their feet threatens to bring the house down as they wait for their hero: Johnny Cash. This is the brilliant opening sequence to James Mangold’s tender and involving biopic of the man in black. As the impatient noise of the prisoners grows, Cash (played by Joaquin Phoenix) waits quietly backstage and the viewers also begin to become impatient as we wait for him to perform. But, as Cash fingers a prison saw, Mangold jumps right into flashback mode and takes us back to Arkansas in 1944 and begins to tell the story of the youngster who would grow into a music legend. This is the unfortunate nature of the biopic. We’ve come to see the great moments; the excitement of the performance; the romance, drugs and pain; but convention states that we have to go through the subject’s childhood as well, and these scenes in a biographical film are often an awkward stumbling block which delays the real meat of the movie. Fortunately Mangold seems to be hold the same opinion, and he deals with the early scenes in clinical and smart fashion. The director concentrates the early stages on the single major incident of Cash’s young life - the tragic death of his older brother - and sets up two of the film’s major themes; Johnny’s guilt over his brother’s death and his long battle to win the respect of his domineering father (Robert Patrick on fine form). Then, with a single cut, we jump forward a decade to see Cash (now played by Phoenix) leave to join the army, and Mangold follows Cash’s ups and downs as he begins writing songs, gets married, attempts various jobs to make ends meet, and pines for June Carter. This is all pretty humdrum stuff and Walk the Line looks ready to be filed away as yet another mediocre biopic, but then something strange happens; as soon as Cash picks up a guitar and we hear that unique booming voice, the movie suddenly explodes into life. It’s not just the film that comes to life when it begins to deal with Cash’s musical career, Joaquin Phoenix also starts to fully grow into the role. The early scenes where we first see Phoenix as Cash are a little awkward. I wasn’t wholly convinced by his performance at first, something about his appearance, his voice, his mannerisms, just didn’t fit. But Phoenix seems to come alive when on stage and his embodiment of Cash is uncanny. He’s got the baritone voice and the confident swagger down to a tee, it truly is a remarkable transformation. As the movie continues Phoenix never puts a foot wrong in his portrayal and will unquestionably be one of the main contenders when Oscar season rolls around, but Phoenix very nearly gets overshadowed by one of his co-stars. In an inspired piece of casting, Reese Witherspoon takes the role of Cash’s lifelong love June Carter and her performance is simply breathtaking. As soon as she appears she injects a massive jolt of electricity into the film and every time she’s on screen Walk the Line kicks up a gear. Witherspoon is funny, vibrant, smart and defiant and her tangible chemistry with Phoenix gives the film a genuine spark. Witherspoon has been giving good performances for years (although none until now to match her breakthrough role in Election) but here she fully comes of age as an actress. She brilliantly captures the struggle of a woman who alternately loves, hates and fears for Cash; and her emotionally complex and stunningly nuanced performance is fantastic to watch. After a while it becomes clear that while Walk the Line may be just a standard biopic, it works much better on the level of a love story. The romance between Johnny and June didn’t come easily - he was chasing her for the best part of two decades before she finally succumbed - but it provides some wonderful moments here. Their ‘meet cute’ when June literally runs into Johnny backstage, a hilarious scene when June discovers Cash and the band wasted hours before a gig and an excruciatingly frosty meeting between June and Cash’s wife Vivian (Ginnifer Goodwin); all these sequences are engaging and compelling when they could have easily been awful in the wrong hands. James Mangold’s direction here is confident and stylish. 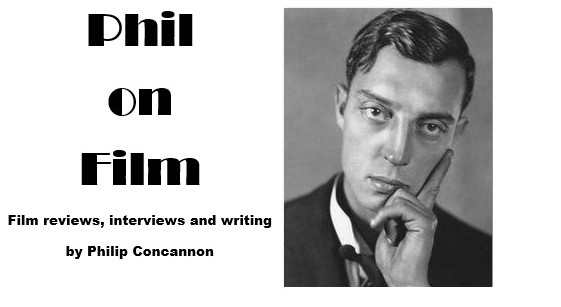 He has come on leaps and bounds from such fare as Copland, Girl Interrupted or Identity, and the chance to put Cash’s life on screen has obviously ignited something inside him. The slick editing and sharp cinematography gives the film a glossy sheen but Mangold doesn’t stint on the pain which always lay just beneath the surface of Cash‘s music, and Phoenix’s acting when depicting the more volatile and drug-fuelled moments is often terrifyingly real. I loved Walk the Line. It is in so many ways a standard biopic which hits all the beats you expect - childhood, early struggles, good times montage, bad times montage, epiphany, triumphant climax - but it handles all the clichés of the genre with a passion and subtlety which is so often missing from these films (just compare this to the dreadful Ray). It’s a brilliant portrait of an artist and a touching love story. It portrays Cash as a hero, but doesn’t shy away from the more unsavoury aspects of his nature. Somehow, this seemingly conventional biopic has managed to do justice to a truly unconventional legend.